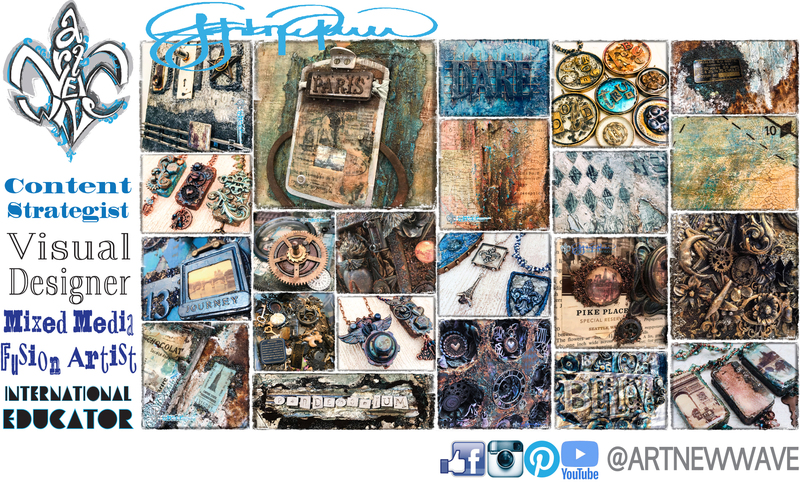 Atelier is an encaustic mixed media fusion collage built on a birch wood base measuring 11.5 x 11.5 inches. This multi-layered collage features a background of color washes beneath a vintage suit jacket pattern which has been set with a crackle finish, with the crackle highlighted with acrylic paints and metallic waxes. This entire background is set under multiple layers of wax with oil pastels added for additional color and dimension between each layer. A variety of different found objects and hand constructed embellishments have been added onto this piece. Antique, naturally rusted calipers hold the focal point of this piece over a texturized upcycled corrugate background. The metal piece has a window with a hand tinted image of the Eiffel Tower revealed beneath the encaustic layered collage of Paris themed images and prints. Naturally rusted mesh is found below the resin set bezel, held in place with hand dyed Sari ribbon. Shipping outside of the United States Additional shipping costs of $75 will be billed in addition to the cost shown for this product via PayPal request. Product will not be shipped until this has been paid within 3 business days of initial order date.